When it comes to your oral health, there are a few things that you need to know to maintain a state of wellness. One of them is how to prevent and fight gum disease, one of the most prevalent conditions facing Americans. As you read on, your local dentist will educate you on the different phases of this condition and what can be done to restore your oral health. What Causes Gum (Periodontal) Disease? Gum disease is a condition that is caused by the most notorious creatures living in your mouth – bacteria. Although they aren’t all harmful, there are enough bad ones to cause several problems with your oral health. Bacteria are always present in your mouth, but when you eat, if there is any leftover debris, the bacteria in your mouth will flock to it and feed on the food. They especially like sugar, so eating snack foods can become quite problematic. 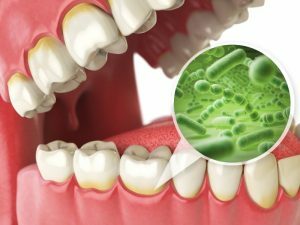 If allowed to grow and multiply, these bacteria can lead to a host of problems – one being gum disease. How Does Gum Disease Progress? Gingivitis – The early stage of gum disease, where the bacteria growth has started to get out-of-hand, is gingivitis. In this stage you may notice bleeding, irritated, puffy or swollen gums. The good thing, though, is that the damage done is still reversible with improved oral hygiene and more consistent visits to your dentist. Mild Gum Disease – If you aren’t proactive enough, then the issue will advance to mild gum disease, where there is permanent damage to the fibers and ligaments that hold your teeth in place. At this stage, your dentist may prescribe an anti-bacterial mouthwash or perform a procedure called scaling and root planing, where your gum pockets and roots of your teeth are cleaned thoroughly. Periodontitis – By the time you get to full-blown periodontitis, you can expect the roots of your teeth around the affected area to completely dissolve, leaving them vulnerable to falling out. Your dentist will decide whether your ivories can be salvaged or will need to be extracted. Prevention is the Best Route! Brush and floss your teeth at least two times a day. Visit your dentist semi-annually for cleanings and checkups. By displaying just a little bit of discipline, you’ll be able to enjoy excellent oral health for years to come! Dr. Jaclyn Jensen earned her dental degree from the University of Minnesota in 2006 and has since gone on to deliver excellent care to her patients for over a decade. Using state-of-the-art equipment combined with her ever-expanding knowledge of dentistry, Dr. Jensen cares for patients at Renu Dental and can be reached for more information through her website.